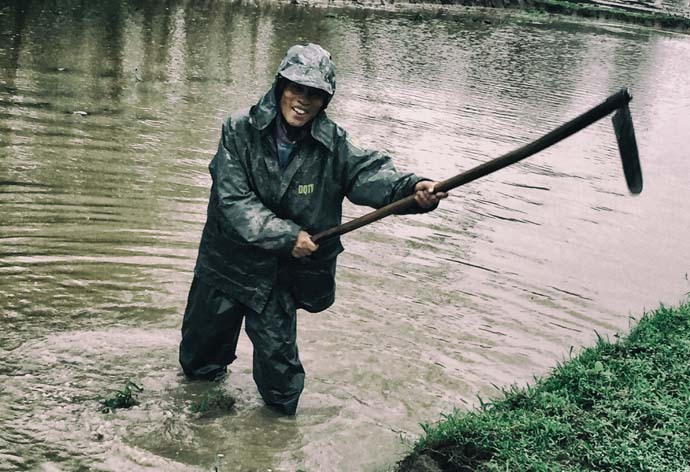 Farmer Le Van Hung can now continue working his rice paddy, happy that at least one dangerous wartime shell will no longer pose a danger to him and his family. Quang Tri Province, 8 December 2017 – An 8-inch (203mm) U.S. naval shell was safely destroyed by a mobile Explosive Ordnance Disposal (EOD) team of Project RENEW-Norwegian People’s Aid on Thursday at the teams’ demolition site in Trieu Trach Commune, Trieu Phong District. The 260-pound shell was found by a farmer who was tending his rice paddy near the Ben Hai River, the former Demilitarized Zone (DMZ). The river marked the temporary demarcation line created by the 1954 Geneva Accords, along the 17th parallel, which divided northern and southern Viet Nam for 21 years. The DMZ was the most heavily bombed and shelled area in the history of the war. The farmer, Le Van Hung, lives in Thuy Khe Village of Gio My Commune, Gio Linh District. He was preparing his rice paddy for a new crop when he discovered the piece of wartime ordnance. 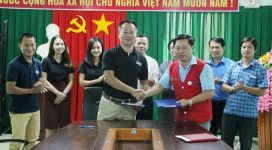 Hung immediately reported his finding to the village chief who telephoned the UXO hotline operated by the Legacies of War Coordination Center. RENEW-NPA’s mobile EOD Team No. 1 was deployed in response to the emergency call. Upon arrival in Thuy Khe Village, the team met with farmer Hung who directed them to the location where he had found the naval shell. RENEW-NPA teams remove the heavy shell from the rice paddy and prepare to transport it to a demolition site for safe destruction. Thursday around noon time the Mk 24 naval shell was safely detonated in a blast that could be heard throughout the area. RENEW’s central demolition site in Trieu Phong District is an isolated, unpopulated location, about 25 km away from where the shell was found. 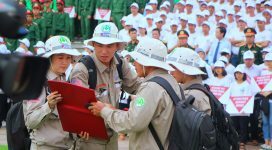 The quick reaction of the mobile EOD team on Thursday is the latest of over a thousand responses this year that demonstrate the success of RENEW-NPA staff’s continuing efforts to rid Quang Tri Province of unexploded ordnance that still remains from the war that ended in 1975. 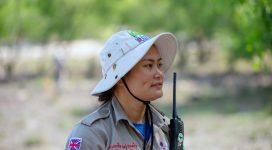 Thanks to frequent alerts from local residents such as farmer Hung, who report immediate, life-saving information that pinpoint UXO locations, the work of making Quang Tri safe is proving to be achievable. More than 15,000 dangerous munitions have been found and safely destroyed by RENEW-NPA teams in 2017. 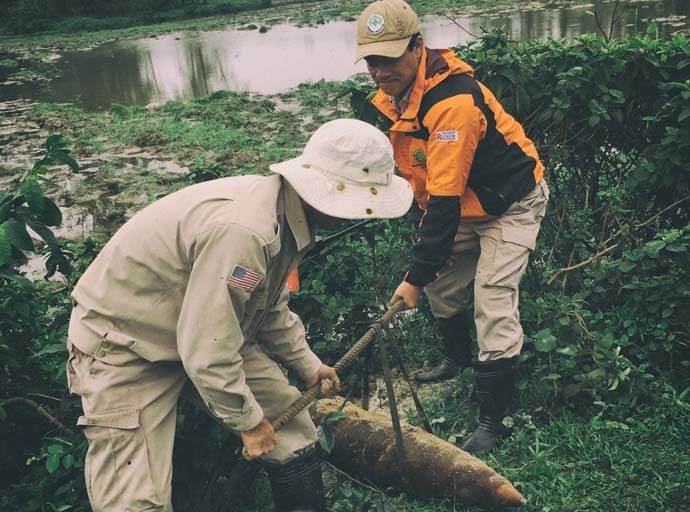 RENEW-NPA’s UXO survey and clearance program in Quang Tri Province is currently funded by the U.S. Department of State’s Office of Weapons Abatement and Removal.